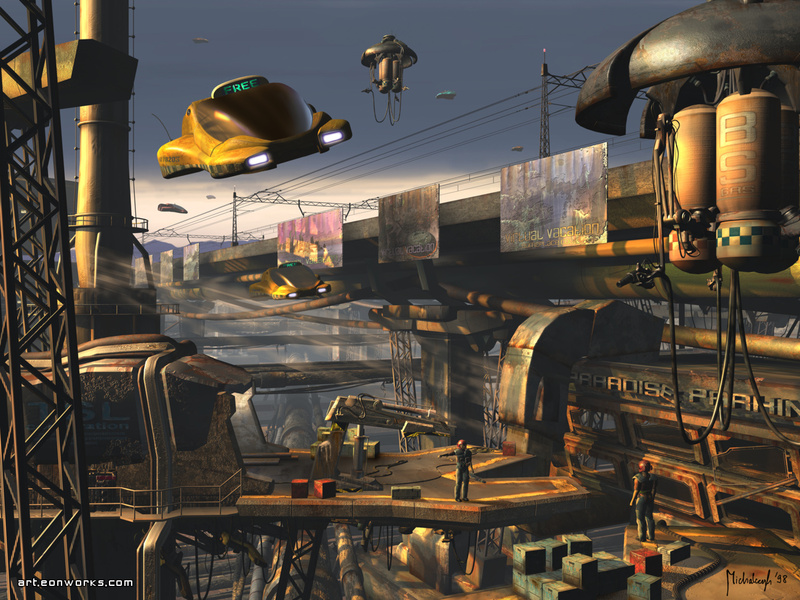 A futuristic scenario depicting the somewhat neglected, massive industrial suburban areas of the future mega cities. I did this 3D Sci-Fi city image for a contest. Initially, the idea was to have a view over a futuristic city with a nice progression from the foreground and the city as the far background. I also planned for more air cars. Due to time constraints I ended up making many changes, so the original idea was no longer there. The whole image was created over a 3 weeks period of time, and took me about 230 hours to complete. Everything was modeled and rendered in 3DS MAX 2. All textures were painted in Photoshop. Suburbs 2100 turned out to be a great success. It was awarded first place at a raytrace competition held at The Party'98 in Denmark. Later, it won an international Fantasy category contest held at the 3D Design & Animation Conference in USA. It was also featured in several magazines, 3D art educational books and was even shown on TV. This must be one of my most popular and successful Scifi images to date. I was totally captivated by this, wouldn't it be awesome if someone were planning a game set in a somewhat related atmosphere, except in a world of magic and technology? I came across this image probably 4 years ago when I was looking for a background for my desktop. After learning it was a 3D rendering, it sparked my interest for 3D programs and applications and eventually led to me getting internships with worldwide construction companies in their design teams. Thank you very much for creating and uploading this image, it has changed my life. It looks like a Star Wars scene out of a game I've played. Really cool. "The future is a terrible place......much dangerous than anyone can imagine".Well,maybe you can imagine it.It looks so cool,and realistic. I am amazed very much of this. Seeing this picture will make me imagine of a place in the future where I am living. <:)> I can't believe this!!! This is very, very, very, very, very, very, very, very, very, very, very, very, very, very, very, very, very, very, very, very, very, very, very, very, very, very, very, very, very,... AWESOME!!!!!!!!!!!!!!!! This picture is on my desktop and i use it as inspiration for my current PC project. It isn't built on the picture itself, or uses any item of it, it just puts the brain cells i need to work things out in the correct order and gives me the edge to continue building it.